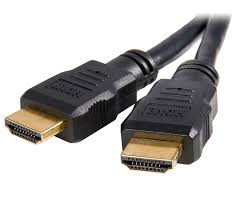 Any monitor that you buy today will have one or more of these types of connections, DisplayPort, HDMI, DVI or VGA. There are distinct differences in each of them. There are 3 components you need to consider when connecting monitors to your computer. The video card, the cables and the monitors. Starting with the video cards in your computer, determine what your connection options are there and work your way out to the monitors, not the other way around! Let’s say the video card in your computer has 4 x DisplayPorts. The optimal connection would be to connect directly from the DisplayPorts on the video card, with DisplayPort cables, and plug into DisplayPorts on your monitors with no adapters or video conversions required. More on adapters below but first it is important to understand the 4 different connection types. DisplayPort is the best type of connection that you can use to connect your monitor to your computer system. If you are shopping for new monitors, choose one that has DisplayPort. The advantage of this all digital type of connection is that you will get the fastest video throughput and sharpest image from your computer system out to your monitors. In addition, DisplayPort supports resolutions as high as 8192 x 4320. This port is often confused with HDMI which looks similar, but if you look closely (see yellow dot in top image) you will notice DisplayPort has only one angled edge on the bottom, HDMI has two. Note that even if your monitor supports DisplayPort, cables are most often sold separately from the monitors. An excellent choice for multiple monitor computer systems. More details on DisplayPorts. HDMI connections are more commonly used with TVs not so much for computer systems. If you need to connect a single TV to a computer, using one HDMI port is fine, but no more than one. There are no multi port HDMI video cards for computer systems since this type of port is really made for televisions. If you have no other choice and require multiple HDMI displays, you can use active DisplayPort to HDMI adapters to convert the signal. Again adapting only as a last resort for example, if you must use multiple TV’s and a video card that has DisplayPorts. If you have a multiple screen computer such as a QuadStation system, HDMI is not the best choice for connecting monitors, unless that is your only option. Since there are no multi port HDMI video cards, you will have no choice but to use adapters. Converting from DisplayPort to HDMI requires what is called an “active” adapter which run about $40 each, you would need one for each display. HDMI connections are digital as well, but DisplayPort is still the better choice for connecting monitors. There are several types of DVI connections. Single Link, Dual Link, all digital (DVI-D) and digital + analog (DVI-I). Your DVI monitors and cables connect a digital source to an analog display, you will need a DVI to VGA adapter like this one shown here. This DVI to VGA adapter will convert to the lowest common denominator, which in this case would be analog will both have one of these types of interfaces. DVI is also a digital type connection and can be converted to VGA (analog) if required using a small DVI to VGA adapter. This is considered adapting down from a digital connection since you would be converting everything to analog only. 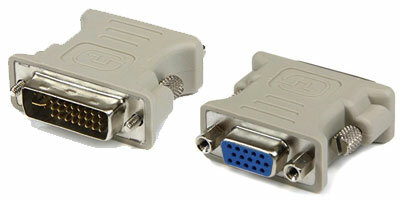 To connect a digital source to an analog display, you will need a DVI to VGA adapter like this one shown here. This DVI to VGA adapter will convert to the lowest common denominator, which in this case would be analog. For example, let’s say you have a high end video card in your computer which has digital outputs by default, but you have older analog (VGA) monitors that you want to connect it to. You would use an adapter like this to convert from the video cards from digital to analog. One side of this adapter will connect to the digital video card, the other would connect to your VGA monitor cable. It is important to know that not all video cards support analog even if the adapter fits. For example an all digital video card cannot be converted to analog if it is not supported by the video card itself. See your video card specs to verify. If you have a newer all digital video card and older analog monitors, you will need to buy new digital monitors. If your video card has DisplayPort connections and your monitors have DVI, you can use an adapter like this one. You will retain the digital throughput of DVI. Remember whenever adapting, you convert to the lowest common denominator in this case DVI. There is no real disadvantage of this for most computer users since the typical resolution used today is 1920 x 1080 (max on DVI is 1920 x 1200). If you require higher resolution than that, you need to have a DisplayPort video card and DisplayPort monitors. This is a “passive” adapter shown here, which means that the monitors used must be in exact pairs (same make and model). For example, lets say you have a 4 port video card in your computer. You can have two of the exact same Samsung monitors on ports 1&2 and have two of the exact same Viewsonic monitors on port 3&4 etc. The key is that they are paired together with the same make and model. If you have ALL of the same exact monitors you have nothing to worry about. If you have a mix match of monitors , you will need to use what is called an “active” adapter which runs about $40 each, you would need one for each display. When using active adapters you can use any combination of digital monitors that you have. VGA ports are analog only, no digital. This type of connection has been around the longest and most monitors and TV’s have a VGA connection. Although analog connections are rapidly fading clearing the path to digital connections, they are still very common. VGA should be your last choice when connecting your computer to your monitors unless this is the only connection that you have. A digital connection such as DisplayPort or DVI is better than using analog VGA. High quality adapters and cables are very important when it comes to properly connecting your computer to your monitors to avoid video issues. As mentioned, it is always best to connect directly from your video card straight to your monitor when possible (DP to DP, DVI to DVI, VGA to VGA). When that is not possible and video adapters must be used, don’t spare the coin here. You will never go wrong buying higher quality adapters and cables. 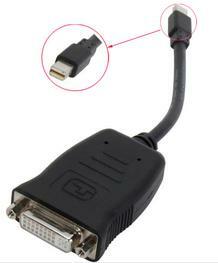 ​Adapters like the one shown above, connect directly to the base of your video card on the back of your computer. From there longer video cables connect from that adapter out to your monitors. Which cables or adapters you use is determined by your video card as well as the monitors that you are using. Long adapter converter cables are available if you must convert video. For example DisplayPort on one end and DVI on the other. The length of a typical video cable is about 6ft. If you are using a multiple monitor computer system you may need longer cables especially if you have 2 rows of monitors to reach that top row. Determine what type of connections your video card and monitors support. Use the appropriate cables to connect directly from the video card to your monitors with no adapters when possible. Always use digital type connections when possible including digital video cards, monitors and cables. DisplayPort should be your first choice, DVI second, VGA third and forget about connecting to HDMI unless you have no other choice. Use high quality cables and adapters. When you buy a system and monitors from NTI we will make sure that you have all of the proper connections that you need. If you are in the market for a multiple monitor computer system, consider a QuadStation Workstation.